I've thought of making a smaller bola version, but I just don't want to throw it around lol. I recently bought some 3/4" bearings. 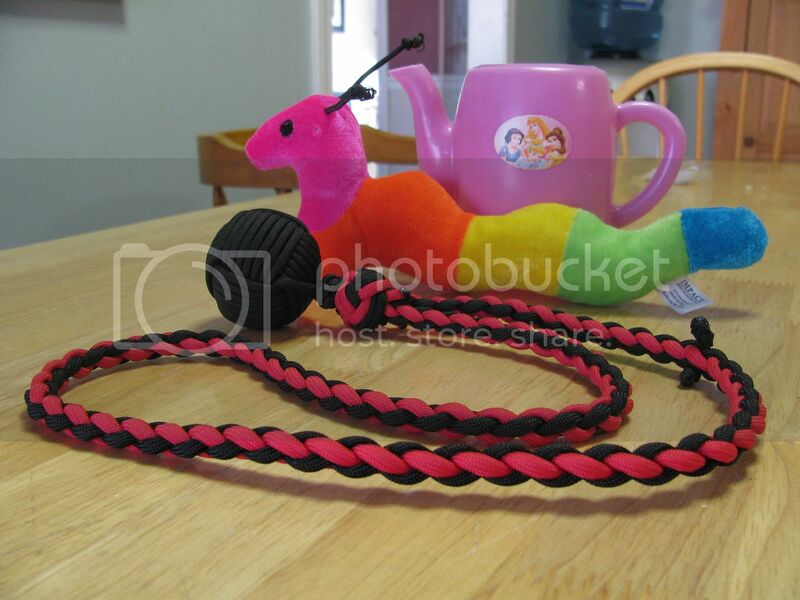 I'm going to make a smaller version with just a small loop and no lanyard. We do lots of tree climbing/rope swinging with the kids (and safety gear). I'm going to keep one handy to attach via sheet bend for throwing over branches w/ smaller diameter cord to then pull the climbing rope over. 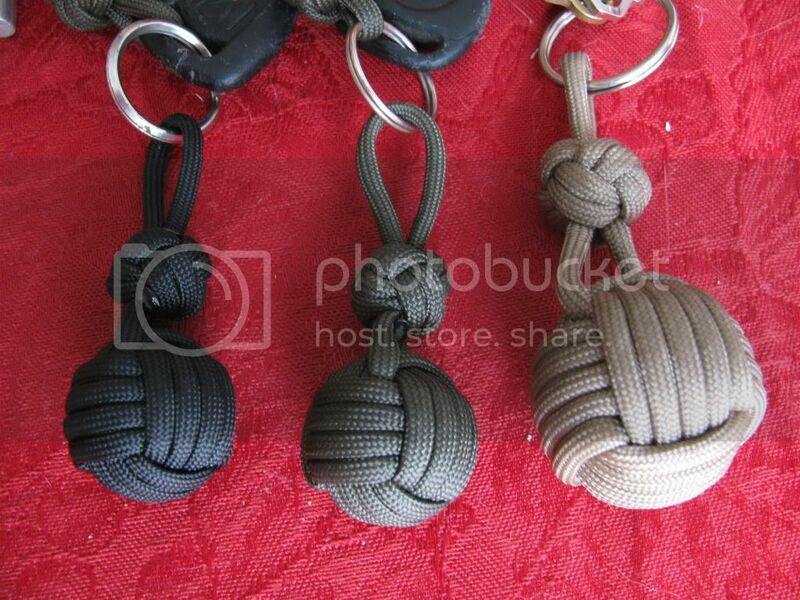 I had the idea for this because I did the same sort of adjusting knot on my keychain lanyard years ago. I thought of the bear bag thing; but being practical, who wants to carry the extra weight. For throwing lines over limbs etc, I use a plastic bag filled with sand or dirt. The line is bio-degradable string. When the line gets tangled in the trees (which is quite common) the rig will eventually rot, the sand will drip out and it will all "go away" in a few years. I have seen a number of rock "fruit" on trees. Also, don't need to carry a special "throwing weight". I agree; thats why I mentioned it as being impractical for use as a bear bag. incidently, I just made one around a small 3/4" bearing. its only 1.5 oz but I was able to throw it with 35' of paracord trailing. it was not as heavy as I thought, but worked well. 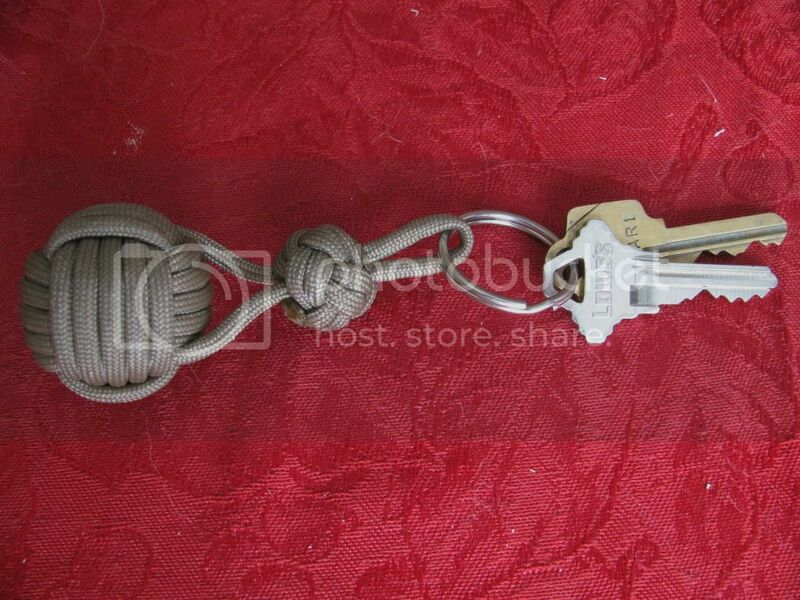 that said, I put it on my key lanyard but won't be taking it hiking. obviously there was lots of heartburn over my original lanyard with the 1.5" ball. 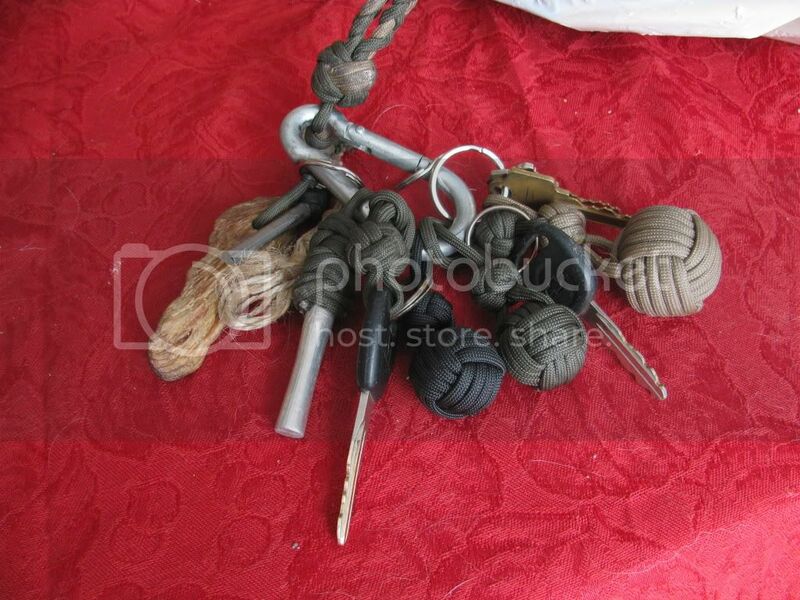 this approach is a little more subdued; each 3/4" monkeys fist is a fob for individual keys. 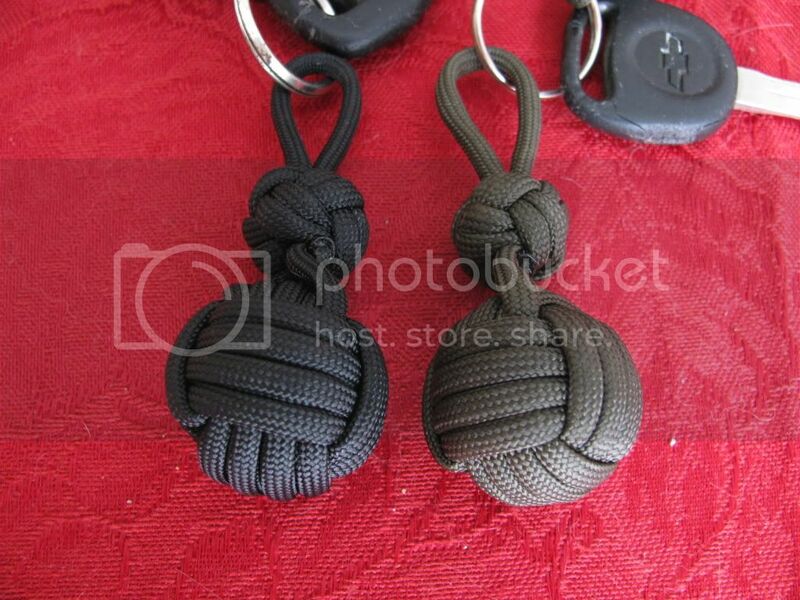 Also shown in tan is one "fob" with a 1" monkeys fist. combined with a heavy carabiner the whole end weighs just over 12 ounces. 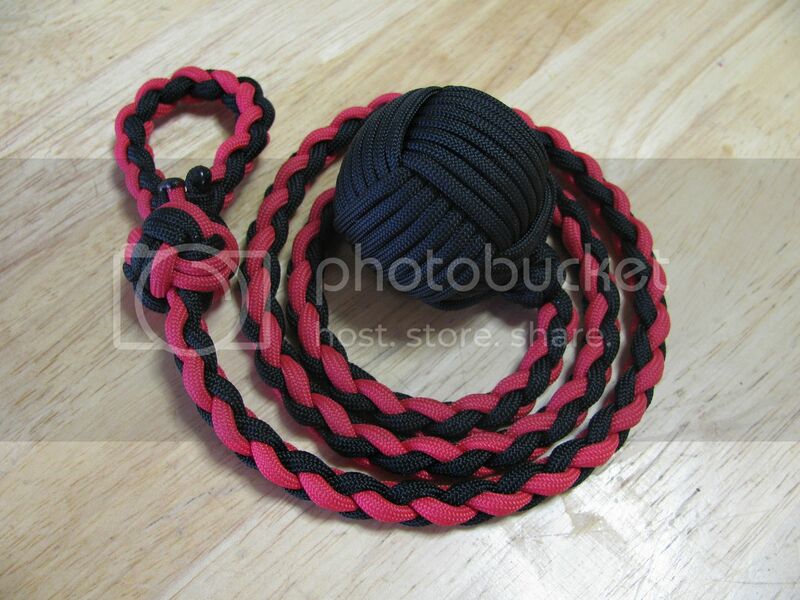 This is my keychain, it was made with a 3 strand braid. 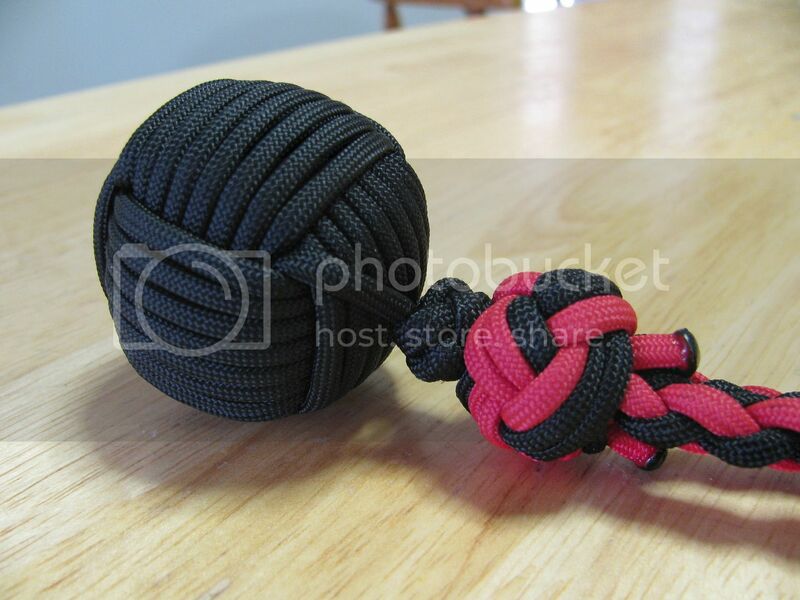 the manrope knot looks a bit different but works the same way. This is getting quite intriguing. But you are going to have to slow down. I haven't even caught up with the basic braiding yet!!! A friend who's a martial arts puff by day and security guard by night saw me reading this thread and exclaimed "now were talking" immediately when he saw this picture. So I asked why and he said the longs ones make a large arc, easy to pick and parry by reflex. Just grab the long line and you've basically disarmed your opponent, but the short one (according to him) produces 80% of the momentum of the big one, cannot be grabbed and is a lot more difficult to spot quick enough to parry. I assume he pulled the percentages from his ... hat. Sure, longer radius of an arc reduces speed the ball travels that arc, but I still can't be bothered to try to figure out the math of skull crunching. And I'm jealous of your knot making skills. Mine always end up twisting or uneven. your friend makes sense. 90% of the time I have my keys in hand, I'm in the "short" position shown in the pic you showed anyway. The ability to stretch it out to 30" is just "cool" I think. the reality of stretching it out in a self defense situation is slim; but lets say there were multiple attackers who were unsophisticated. perhaps no one would be brave enough to take their chances as you whirl the thing around? I don't know. 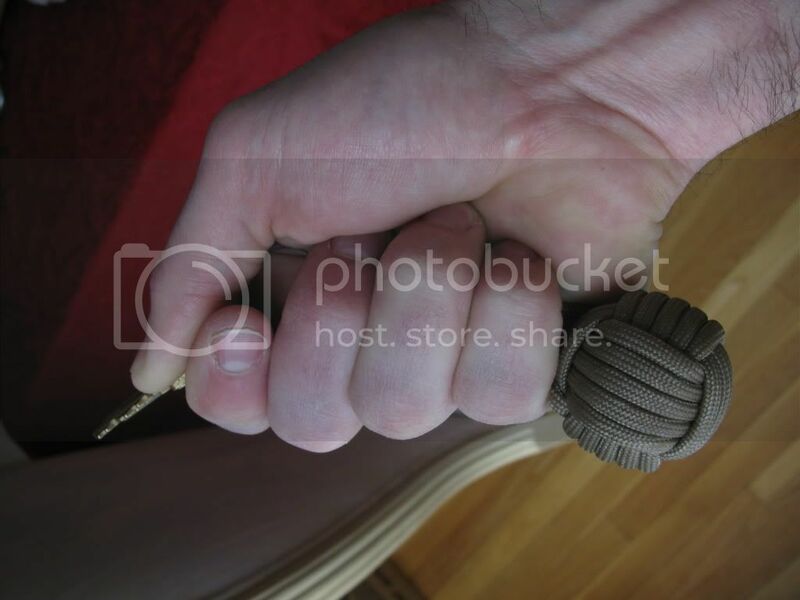 I'll tell you what, I can swing this thing so fast and so quick using "rock sling" technique I'm guessing your arm will be in a huge world of hurt if you stick it out and let this thing wrap on you. just saying. I was getting worried that by now you'd figured out a way to braid an entire Smart Car out of paracord. Guess I've got a few more days to catch up.